For the past fifteen years or so, I have watched the sunlight and the lamplight play across a pair of 1800 year olds on my dining room buffet. 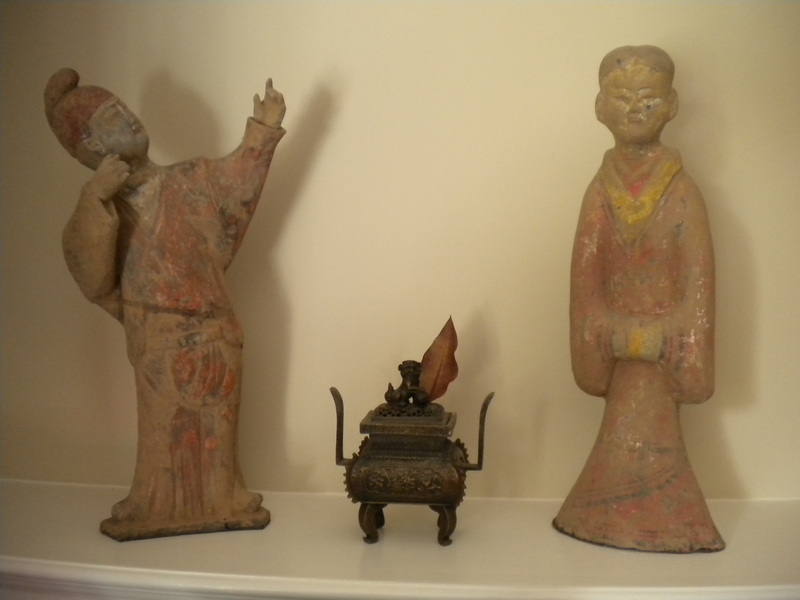 They’re Han Dynasty (200 BC – 200 AD) Chinese terracotta funeral figures, about 15 inches tall; one is an Archer (left in picture above) with wide sleeved, flowing arms outstretched shooting a taunt bow and arrow (both now missing, but powerfully “implied” in the design). The other is an august, Confucian Scholar figure with traditional puffed sleeves and long flowing skirt bound at the waist with a wide cloth belting in which a scroll is tucked. Both have faint paint traces of their former multi-colored selves. Judging by the the nobility, grace and elegant line of these ceremonial works, they were probably buried in some ancient aristocrats tomb along with many other serving figures to make their benefactors after-life as comfortable as it was before–death. Putting aside the historical and cultural aspects of my two constant companions, I would like now to explore some of their implications. What they represent (I do not know the Chinese word for it) is what we may call “face”. That is to say, that image or symbol of the supreme cultural values most highly cherished throughout much of Chinese history. The term “Face” carries with it all the accumulated pride and respect of past generations and, going forward, perpetuates those values even unto the eternal. We could say that “Face” in our modern western world, equates to the same eastern values of “success,” “wealth,” “fame,” and “family,” with each culture claiming its own ways of evaluating and measuring the qualities of a life well lived. Still, all these cross-cultural values are founded on a profound, indeed critical – need for “Respect”. In other words, it seems there is no “Good Fortune” in China or America or anywhere else on the planet without this primary and personal egoic driver we may call respect. All this isn’t a “bad” thing of course; it’s just the way we humans become acculturated and conditioned to somehow function in time and space. But that limited living experience with all its daily struggles falls far short of our natural potential for whole and unlimited expression! Now “losing face” in non-dual terms, is all about losing that kind of self “respect,” usually either slowly, through enduring a thousand cuts that never heal, or suddenly, in one fell toppling of our imagined self. (It also seems that humanity is spiritually evolving and that there may be less “suffering” involved in waking up these days, as noted by Eckart Tolle) Either way, a shattered image is very painful, not only because destruction of any construction is naturally painful, but more importantly, it’s the loss of “face” that we have so heavily invested in as our “self.” It’s the loss of all that we think makes us somewhat human and somewhat happy. And what’s more, it’s the loss of what we consider to be something factual, substantual and real. After all, as Allen Watts said, “Images are even more powerful than intellectual concepts.” In fact, we believe in and worship various images sacred and profane throughout our life span…until we don’t! The specific and general weight of “face” changes with passing time. We can note what Watts said in the 1970’s: “Christianity has institutionalized guilt as a virtue” and no doubt add a long list of contemporary examples of face – alterings that carry with them the common burden of Guilt/Beliefs in our time. And, of course, the more difficult the Belief, the more our Faith is tested! Did I say “Faith”? I meant “Face”! Whatever challenges our Face values is indeed a threat to the operating concepts of our much vaunted personal identity. So the Good Life today seems all about winning and keeping the Face while – in real time, actually…it’s about losing. We lose from the time we’re born, and we lose more than “time”. We keep losing our Self in conditioned, cultured and credentialed dream-careers that don’t satisfy or last, and in our Constitutionally Guaranteed Pursuit of Happiness. A happiness which we may not have achieved yesterday, but which we will hopefully secure, tomorrow. Indeed, we live and die in Yestermorrow! Losing Face then, is all about re-cognizing our Self behind this mask we’ve innocently acquired. And that loss, to be brutally honest, is not bearable by any person; losing face leaves no self. One comes to see the Grace of it all – there never was any real self to be lost or gained. The Archer tells us there is nothing to shoot for, to aim at, to become in time, with effort, but simply to Be.Here.Now. The Scholar tells us that knowledge is limited and limiting, that what we are is not-a-thing; and that real wisdom lies in recognizing what we are not: Not an idea. Together, these antique funeral figures are living reminders of how images and “the Media” of the day powerfully influence behaviour, taste and tradition; and that things – especially beautiful things – may represent societies priorities and egoic productions in time and simultaneously point us to far greater timeless truths by showing us not so much what we are, but more importantly, what we are not.